Period VII graduation will be held on January 19, 2019 in Samantha Krida Building UB. There is no cancellation, change, nor addition of graduation participant quota. Participants who cannot attend the ceremony may attend the next period ceremony and pay the fees as regulated. 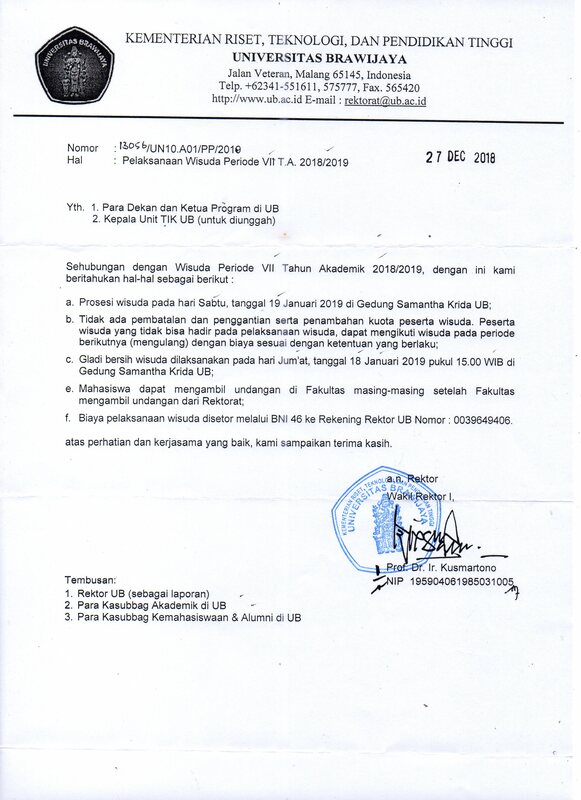 Rehearsal of the graduation will be held on Friday January 18, 2019 at 15.00 WIB in Samantha Krida Building UB. Students may take invitation on their respective faculties after faculties take the invitation from rectorate. Fee for the graduation ceremony can be paid to BNI46 account of Rektor UB No: 0039649406. Such is the announcement, thank you for your attention and cooperation.